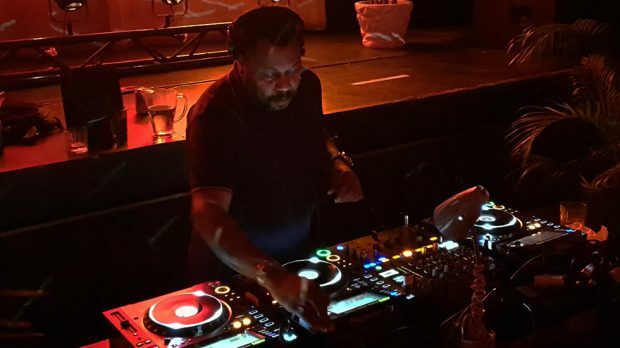 Chicago’s Derrick Carter is a legend of house music. The man has been coming here for many years, dishing out quality sets of his trademark style of boompty house, mixed with effortless precision. Sometimes mixing across three decks, the man has skills. He’s an old school DJ, a real DJ. Last Friday however was something a little different for Derrick, with Habitat bringing him out for a special disco set – as part of the Derrick Does Disco tour he’s been playing in select venues around the world. 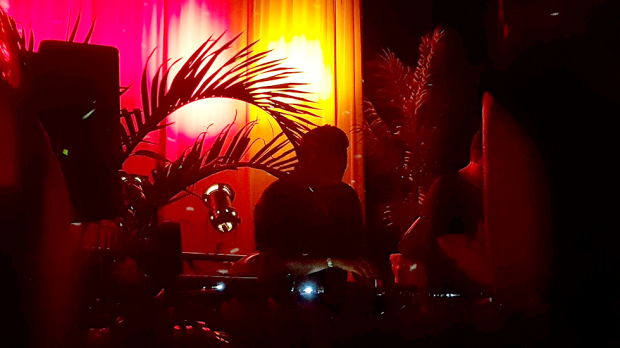 And it was a real treat to witness as we got to see another side of Carter, as he pumped out a real fun and funky set that had everyone moving and grooving into their weekend, reaffirming why he’s considered one of the best in the biz. Nothing flashy or showboaty. Just a great selector who knows how to read a crowd, feel the vibe and work that mixer. The Habitat crew have once again been killing it this summer, putting on a host of great gigs featuring some of the best house DJs from around the world, in unique and interesting venues, often outdoors like this, making the most of the weather. Tonight they combined forces with Charlie Bucket and the Dancing In Space disco crew out the back of Late Night Valentine in the cosy little amphitheatre – a great, and underutilized space for an intimate sized gig – with a capacity of 300. The inside and downstairs rooms of the venue were also used, though when Derrick was on, that’s where most people wanted to be, unfortunately for some of the selectors playing some great tunes – such as Matt Green going back to back with Bantah in the Del Boca Vista Basement, and local legend RTRFM’s long-time Full Frequency Friday host, the inimitable Rok Riley dishing out some sweet beats with her smiley, infectious, positive vibes. The man with some of the deepest crates around when it comes to all things disco, soul, funk and rare grooves, Charlie Bucket kicked off the Friday celebrations for the early crowd from 6pm, before Habitat’s house hero James A took over the decks, building the vibe up till Carter’s appearance. Derrick Carter was scheduled to play 8-11pm, though he ended up coming on around 8.30pm, but more than made up for it by playing till midnight. 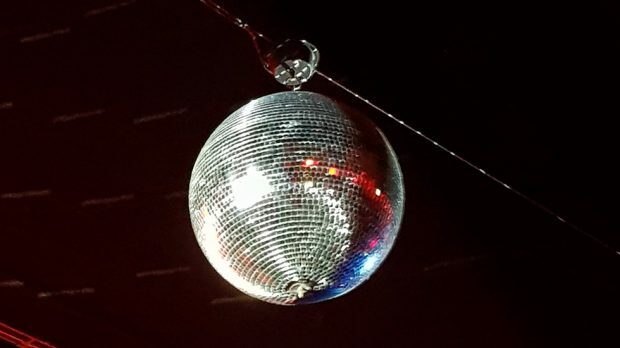 Once he got into the groove, the crowd started to feel it, and the big bowl was full of bodies bumpin’ and grindin’ illuminated in red lighting under a big spinning disco ball. Or you could sit on the steps and just watch the man go at, as he constantly kept it moving, with long, winding seamless mixes. Donna Summer’s classic I Feel Love was mixed with Hall & Oates’ I Can’t Go For That (No Can Do), and he kept the blend going, mashing up the two deftly with just the right balance, making it work. There was a mix of some more electro flavoured numbers, and some modern housey sounds here and there, but tonight’s set was mostly full of glorious shimmering disco moments, that with credit to Carter’s style and quality selections avoided sounding cheesy, even when he mixed in the odd classic like Toto’s Georgy Porgy and I Need Your Lovin’ by Teena Marie, that you could just imagine going down well at a roller disco. Whilst he was just using CDJs, he still had plenty of vintage selections, really working that mixer to get the fattest, funkiest sound, reminding us of forgotten classics like the 1983 Paul McCartney and Michael Jackson collaboration Say, Say, Say, which had the crowd marching and singing along, punching the air emphatically. He faded out his last funky track around midnight to huge cheers – it seemed everyone was just starting to hit their stride and could’ve easily kept dancing for another hour. Luckily, despite Carter’s set being over, there were still some great options inside, with Roland The Realest laying down some smooth 80s flavoured synth-bass grooves and vocal tracks. Downstairs SNB from RTRFM’s Trainwreck show was killing it, playing some more up-front, hard-hitting house for those that wanted to get down. For some, the party then kicked on at Geisha, but the LNV early session with Carter was a great way to start the weekend. A super enjoyable night all-round with a unique set of disco selections mixed by one of the best in the game. Derrick Does Disco indeed.